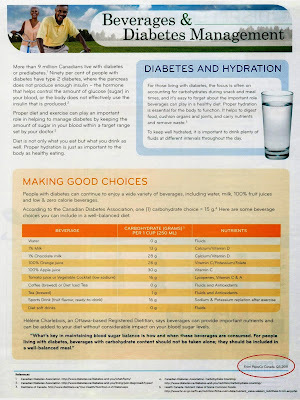 Weighty Matters: Canadian Diabetes Association Taps PepsiCo to Educate its Certified Educators? 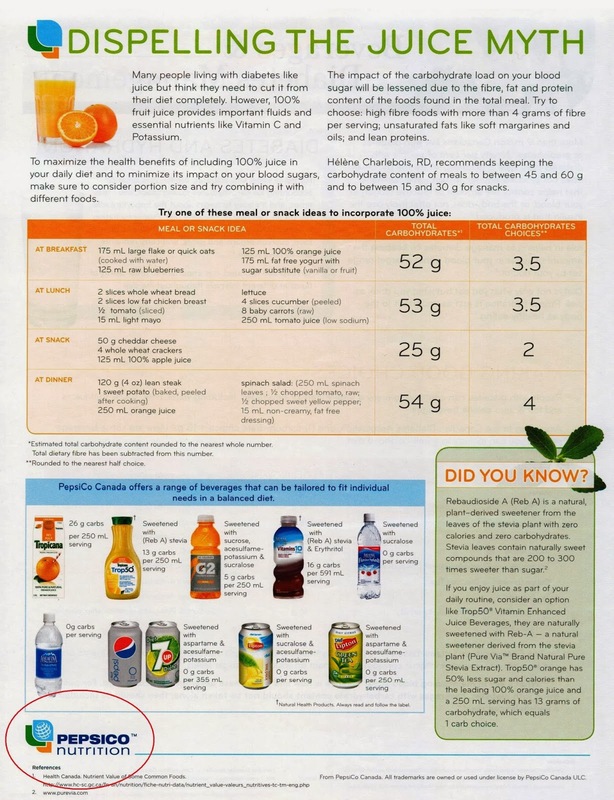 Canadian Diabetes Association Taps PepsiCo to Educate its Certified Educators? Good lord! Here's an insane guest post from our office's RD Rob Lazzinnaro. As well as being an RD with an MSc., he's also a certified diabetes educator and as such he receives the Canadian Diabetes Association's Diabetes Communicator publication. Have a peek at what he found. 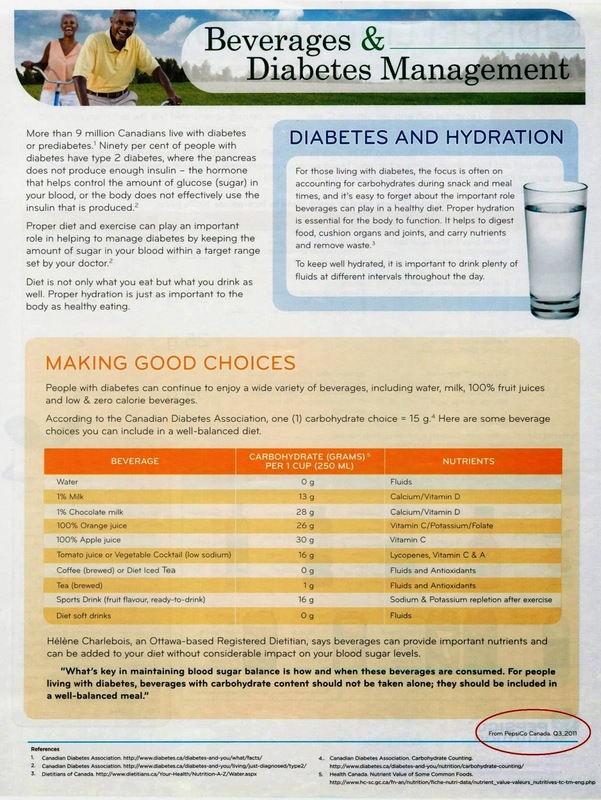 I recently came back across an article/advertisement I received last year in a publication distributed by the Canadian Diabetes Association (CDA) called the Diabetes Communicator. I signed up for this publication to stay up date with my local Diabetes Educator Section (DES), and with the CDA. It was entitled, "Beverages & Diabetes Management", and it was a two parter. The first talked about "Making Good Choices", and the second, "Dispelling the Juice Myth", and the pieces were written by Pepsico Canada. As a Certified Diabetes Educator (CDE) I would like to openly ask the CDA - what could you possibly be thinking? 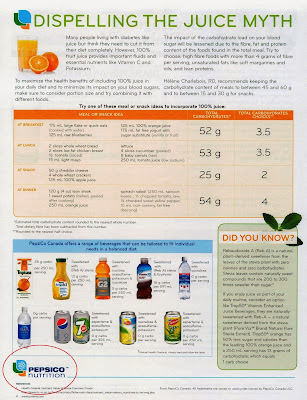 Partnering with one of the largest providers of processed beverages to present info on nutrition would seem to only diminish the CDA’s credibility - especially if the information provided ran contrary to good diabetes care and education. So what information is provided? While the advertorial does not recommend sugared soda for diabetics, it does state that juice, chocolate milk and sports drinks are good choices for hydration and nutrition in diabetes management. It also seemingly encourages juice consumption with each and every meal and snack (though there is a note stating that what clearly looks like a recommended daily menu plan is in fact a plan designed to help you figure out how to incorporate juice into meals and snacks) amounting to a consumption of 3/4 of a litre daily (along with 14 teaspoons of sugar). These drinks have similar (and often more) sugar, carbohydrates, and calories ounce for ounce as regular soda. They are effectively flat soda with vitamins. If you drink them regularly you will have to consume less whole food by volume in order to balance carbohydrate intake, not exactly a recipe for feeling satiated. Speaking of satiation, liquid calories simply do not fill us up as well a whole food, due to their lack of fibre, lack of actual chew and ease of consumption. Drink these beverages and no doubt, even when consumed with a meal, your sugars are heading higher than were you to consume water. In the real world what ends up happening is that these liquid calories are consumed on top of the rest of the meal not within it, which equates to regularly consuming excess calories and carbohydrates. While I fully understand why PepsiCo would want everyone (including those with diabetes) to drink large volumes of juices and sport drinks, beyond the desire for advertising dollars, I'm not sure why the CDA seemingly agrees.